Cambridge is a charming historic town on the Choptank River, a major tributary of the Chesapeake Bay, on the Eastern Shore of Maryland. Located in Dorchester County, Maryland, just 90 miles southeast of Washington DC, the waterfront community makes a great getaway destination for those who enjoy outdoor recreation and exploring small towns. The historic district features brick paved streets with parks, a marina, museums, and a lighthouse on the water. The area attracts nature lovers, birders, photographers, cyclists, and paddlers to the Blackwater National Wildlife Refuge. Over the past few years, Cambridge has been experiencing a renaissance, as old buildings are being renovated and returned to their former glory. One-of-a-kind shops, boutiques, and galleries, as well as a variety of new restaurants, have opened. From Washington, DC, Virginia, Baltimore, and points west: Take Route 50 East, pass over the Chesapeake Bay Bridge, continue on Route 50 for about 40 miles. After you cross the Choptank River Bridge, make the first right onto Maryland Avenue. Go about a half-mile, cross over a small drawbridge and continue straight where Maryland Avenue becomes Market Street. Turn Right on Spring Street. At the intersection of High Street, you are in the center of town. Take a Right on High Street and continue to the end of the street to reach Longwarf Park and the lighthouse. There is a parking lot next to the lighthouse and street parking throughout the town. Choptank River Lighthouse - 10 High Street Cambridge, MD. 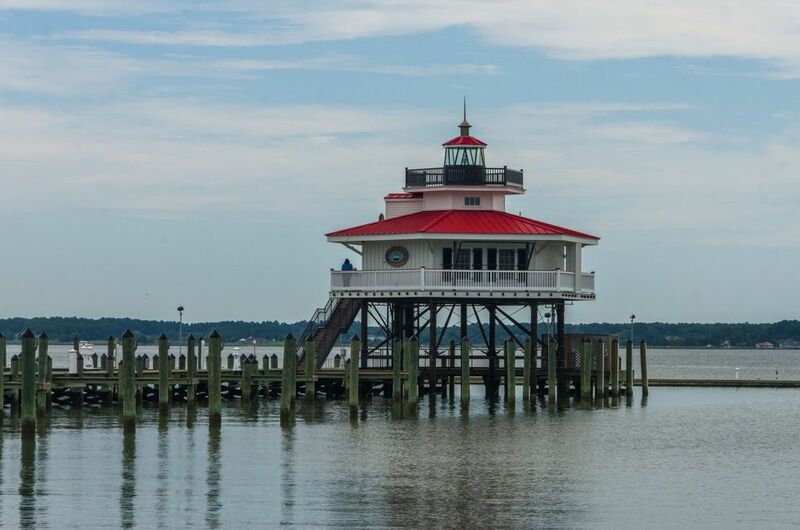 The replica of a six-sided screw-pile lighthouse that guided mariners along the Choptank River for generations is open to the public for free, self-guided tours daily from mid-May through October. Harriet Tubman Museum & Education Center - 424 Race Street Cambridge, MD. The small museum highlights the life and stories of Harriet Tubman, the Underground Railroad heroine and Dorchester County native. She escaped slavery and returned to lead dozens of others to freedom. Open Tuesday through Saturday. Blackwater National Wildlife Refuge - Established in 1933 as a waterfowl sanctuary for birds, Blackwater is located 12 miles south of Cambridge and consists of more than 25,000 acres of tidal wetlands, open fields, and deciduous forests. Visitors may bike, walk, or drive along the trails to view wildlife. There are three paddling trails, as well as hunting/fishing/crabbing opportunities. Richardson Maritime Museum & Boatworks - Maryland Avenue & Hayward Street; Cambridge, MD. Founded in memory of a prominent local boatbuilder, the museum displays ship models and boatbuilding artifacts. The Ruark Boatworks Build-A-Boat Program gives student groups the opportunity to learn about maritime heritage while building their own boat and model.